Hi-tech medical testing could be made much more accessible with this cheap hand-held device which attaches itself to a smartphone. The spectral transmission-reflectance-intensity (TRI)-Analyzer attaches to a smartphone and analyzes patient blood, urine, or saliva samples as reliably as clinic-based instruments that cost thousands of dollars. Image credits: University of Illinois at Urbana-Champaign. It’s capable of analyzing patient blood, urine, or saliva samples as reliably as standard lab equipment which costs thousands or tens of thousands of dollars each. It’s also small and can be easily moved around the hospital. Cunningham and his colleagues detail their findings in a recently published paper. While not identical, their results were comparable to typical lab tests. 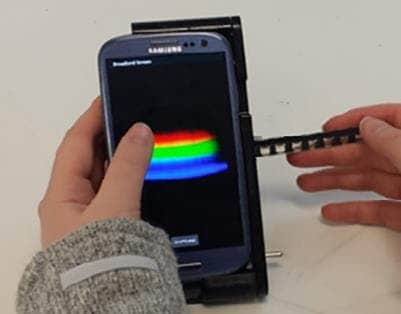 The portable lab works by turning a smartphone’s camera into a high-performance spectrometer. It illuminates the sample with the phone’s internal white LED flash (or an inexpensive external diode). The light is then gathered into an optical fiber and sent down a diffraction grating, into the phone’s camera. All of this is arranged into a 3D printed plastic structure. Due to this simple, scalable structure, the device can also analyze several samples at once. “Our Analyzer can scan many tests in a sequence by swiping the cartridge past the readout head, in a similar manner to the way magnetic strip credit cards are swiped,” said Long. For now, they used it to conduct two tests: a biomarker associated with pre-term birth in pregnant women and the PKU test for newborns to indirectly assess enzymes associated with normal growth and development. Researchers say it could be used for a wide array of other tests, including a wide variety of proteins and antibodies in the blood. Basically, like any light spectrometer, it’s able to detect anything that causes a change in the color or light output of the sample. It’s not just medical applications either — the device could be used in animal health, environmental monitoring, drug testing, manufacturing quality control, and food safety. The technology has been patented and is available for license.